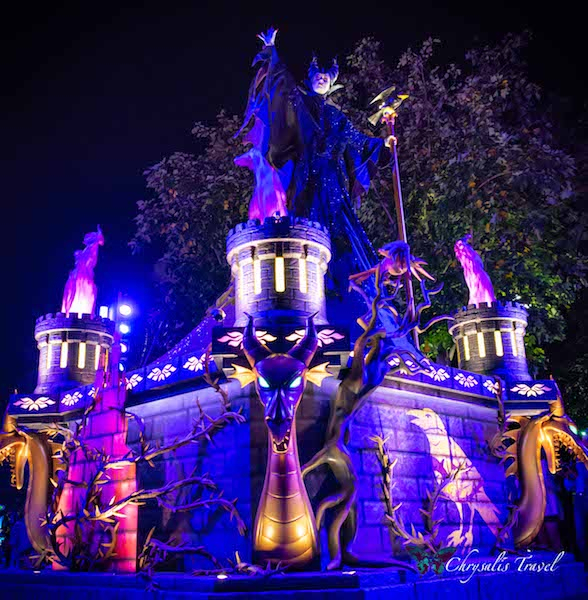 How does Shanghai Disneyland celebrate Halloween? Come along, as we share our explorations of the Park after dark. Shanghai Disneyland (SHDL) – the biggest Disney castle Park in the world – celebrated their Grand Opening only two years ago, on June 16, 2016. The first year, Halloween festivities were centered around Disneytown (their Downtown Disney). 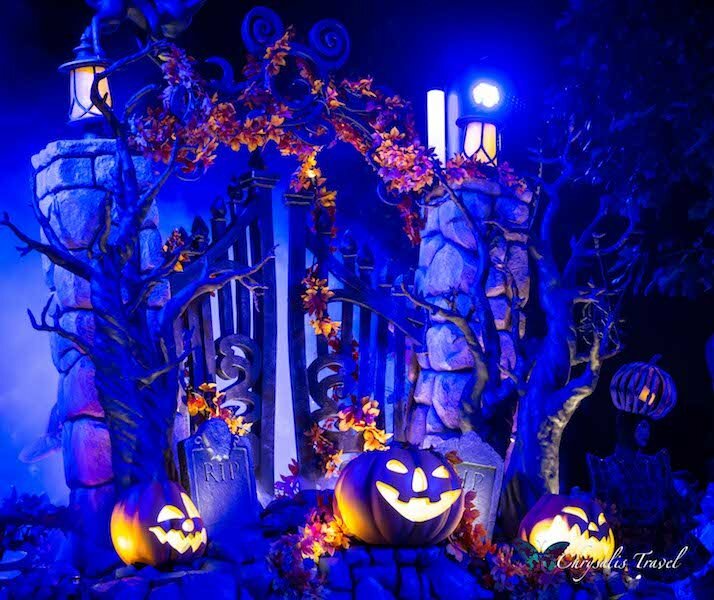 2018 is only Shanghai Disneyland’s second Halloween season, and they have done a remarkable job. 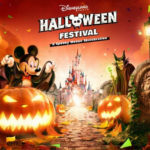 Similar to all the other Asian Disney Parks, your Park admission ticket includes all the Halloween festivities. Separate Halloween party tickets are not required. 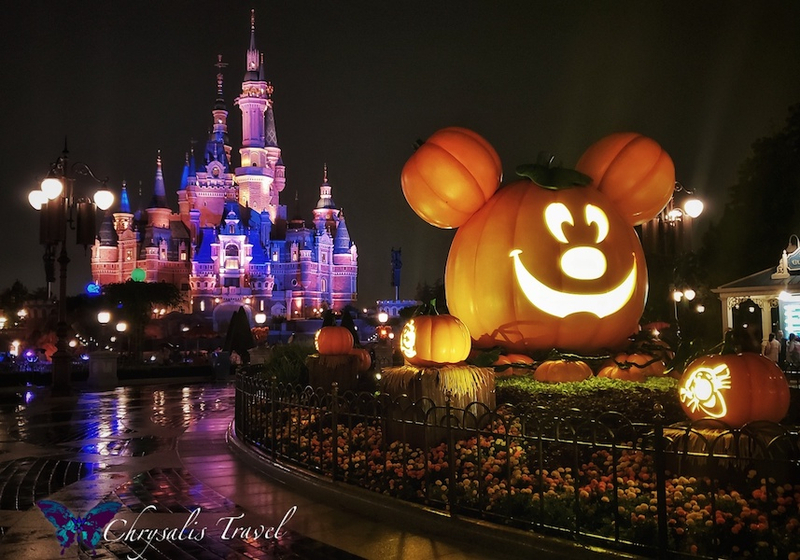 In this article, we cover the night time Halloween festivities at Shanghai Disneyland, including the parade. 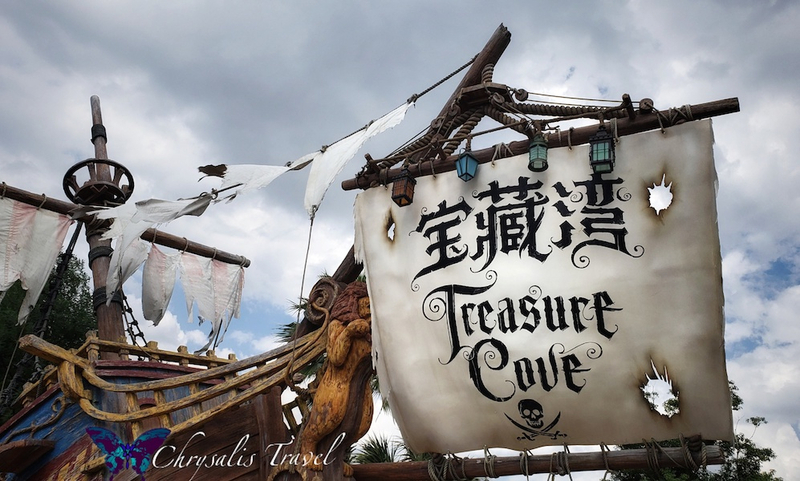 Some ghost pirates may materialize in Treasure Cove. We’ll highlight Trick-or-Treating in the Park, and also look at special Halloween merchandise at SHDL. 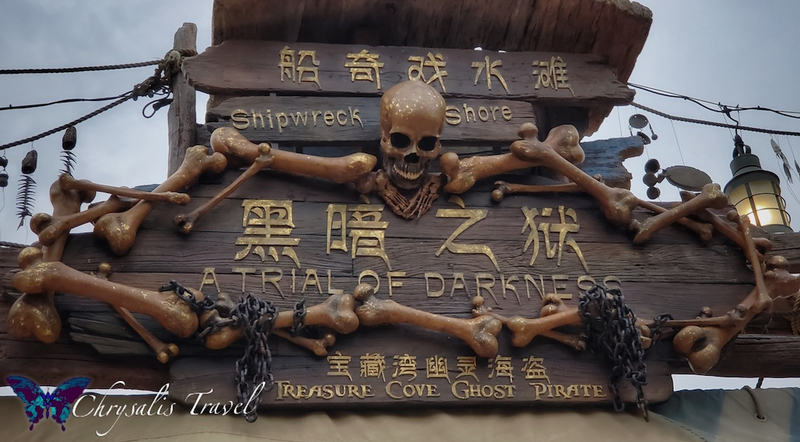 We invite you to read our companion article in this two-part series: “Daytime Halloween Delights at Shanghai Disneyland.” In that article, we share how Disney magic has decorated the Park. 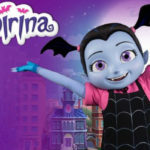 We also highlight Halloween costumes of your favorite Disney characters, and explore special foods of the season. 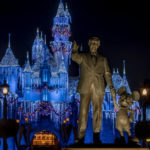 If you enjoy Disney-style Halloween after dark, this article is for you. Shanghai Disneyland’s evening parade, “Mickey’s Halloween Treat Cavalcade” was a hip mix of Disney Villains with Mickey and his pals. 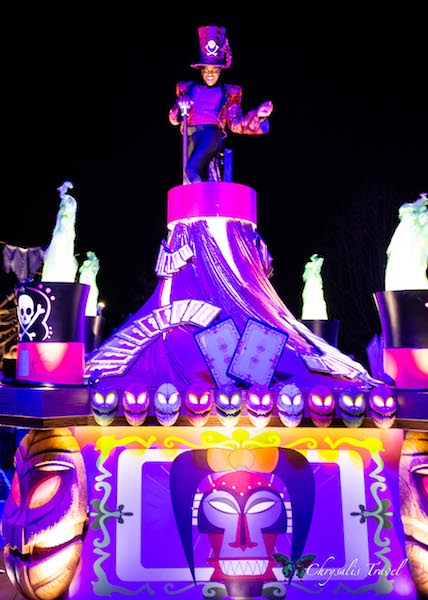 Tokyo DisneySea also included Mickey and friends in their “Villains World” water pageant this season. 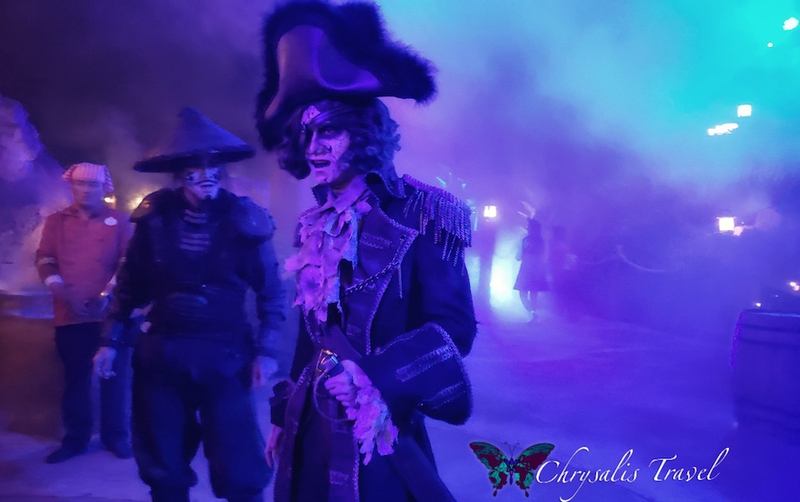 Hong Kong Disneyland’s “Villain’s Night Out! Chapter 3” included only Villains. Mickey and Minnie are on the first float. Goofy, Pluto, Donald and Daisy (dressed in their daytime meet and greet costumes) led the way. 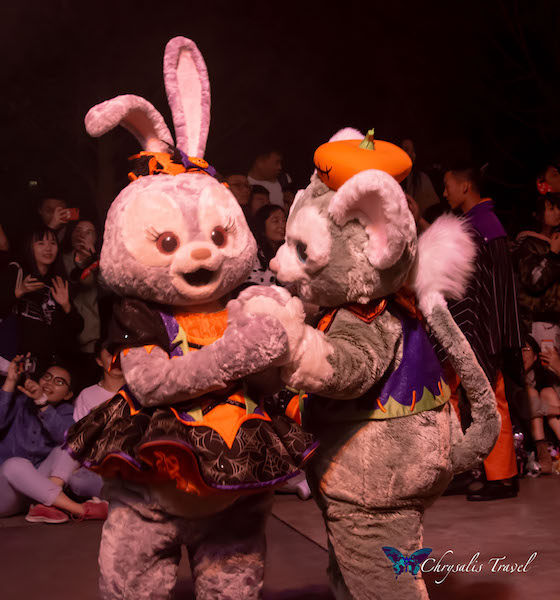 See their costumes up close in our accompanying article covering daytime Halloween festivities at Shanghai Disneyland. The Villains floats follow. Doctor Facilier dances to the beat of “Are you ready?” He’s got friends on the other side. Maleficent looks majestic, ready to cast an evil curse. 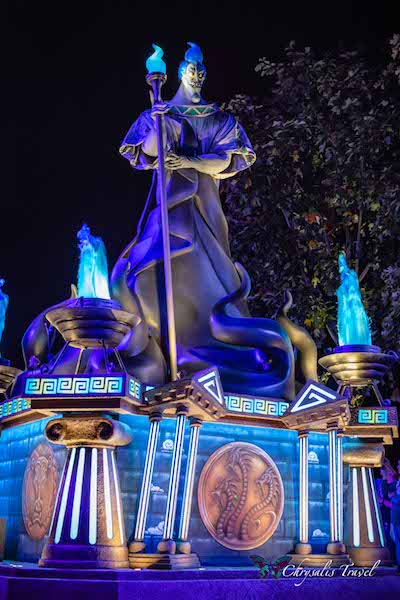 We love the dragon details on her float. Hades, Lord of the Underworld, plots his revenge. He is followed by the three Fates and their collective Eye. From the beginning, Shanghai Disneyland has favored the live-action interpretation of Alice in Wonderland. Their Alice maze features characters from Tim Burton’s world. 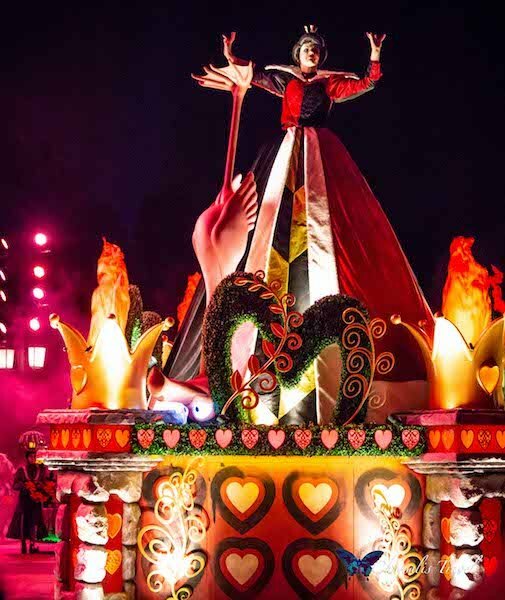 This Queen of Hearts playing croquet in SHDL’s Halloween Cavalcade is not quite the animated version we usually see. The last float looks ominous, with a creaky gate and jack-o-lanterns. But then, we see it’s Duffy and friends wrapping up the parade. 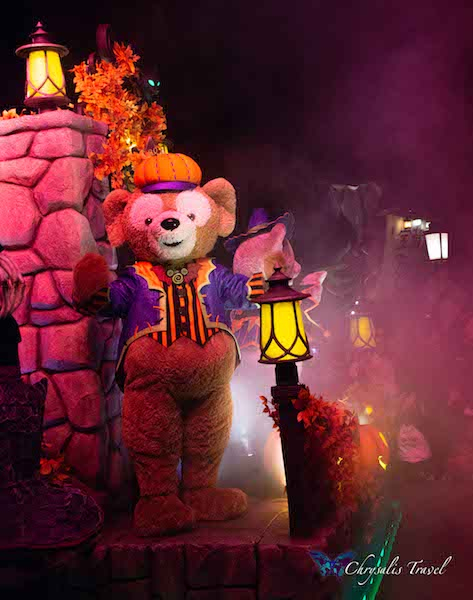 This is Duffy’s only nighttime Halloween parade appearance in the world. ShellieMay rides with Duffy on their float. StellaLou and Gelatoni dance behind to wrap up the parade. We were impressed that SHDL had projections on Enchanted Storybook Castle to accompany the cavalcade. Have you ever seen a parade with its own projection show? Here’s a short video. Want to see all the floats? 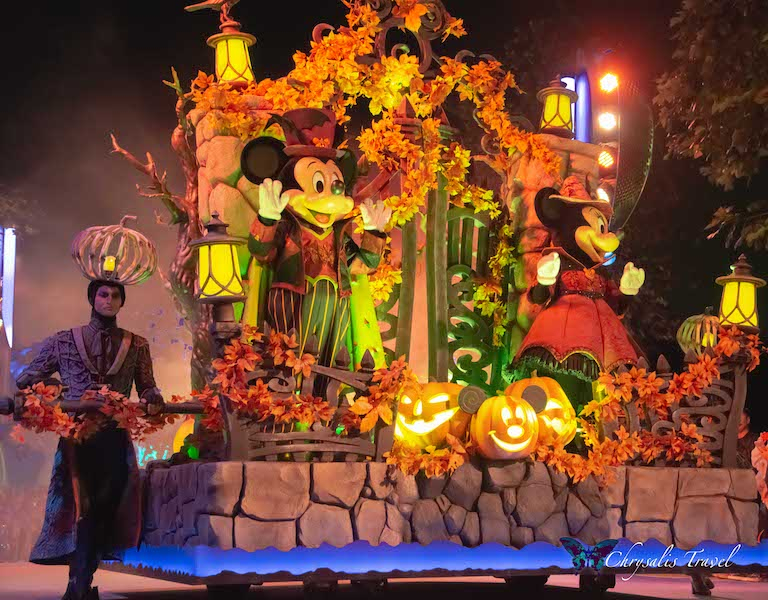 This is a shortened video of “Mickey’s Halloween Treat Cavalcade” parade at Shanghai Disneyland. It includes the major floats and characters, but cut out some space in between floats. Arrrr you looking for Halloween haunts of a more ghostly nature? Look no further than Treasure Cove. 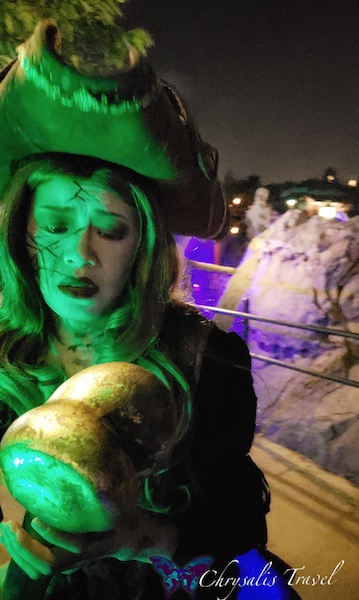 We hear tales that when the moon shines just right – between 7-8 pm – Shipwreck Shore is transformed into the haunting grounds of Captain Salazar and his crew. We went seeking adventure and found Captain Salazar himself. He be looking for rum (and spoke English). 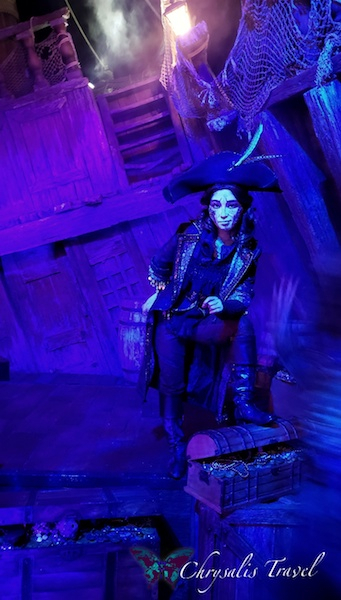 Wandering through the purple-lit foggy decks of this shipwreck, we found more ghost pirates. Some were just hanging out. Others were in more distress. This one was asking guests for help with her large bone. Some had gotten into too much rum. Others may have been trying to warn guests of impending doom. We were impressed by the number of female ghost pirates on the ship. 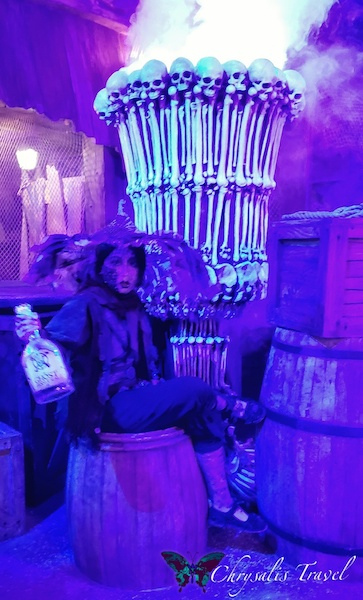 However, the pirates would not materialize in the rain, and the attraction was shut down in cases of inclement weather. 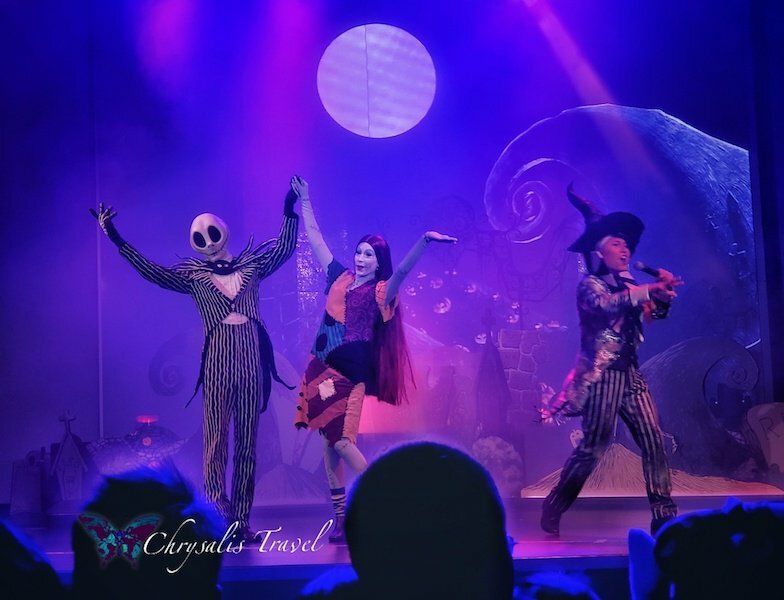 After dark, Jack Skellington hosted the “This IS Halloween” Dance Party on the Pepsi E-stage in Tomorrowland. (Shanghai Disneyland is the only Disney Park to be sponsored by Pepsi and not Coke). At Hong Kong Disneyland and Shanghai Disneyland, Jack spoke the local language (Cantonese / Mandarin), and Sally spoke in English. Guests in costume were invited onstage to participate. Here’s a short video we caught on our way to ride the TRON Lightcycles. 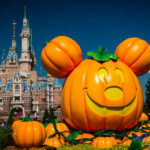 Shanghai Disneyland wins the prize for best trick-or-treating of the five Disney castles we visited this October. They had so many cast members everywhere that were giving out candy from Mickey pumpkins. Hong Kong Disneyland had trick-or-treating, but it was limited to the Festival Gardens in Fantasyland, and was weather and time-dependent. To their credit, their candy was branded specifically for Hong Kong Disneyland. 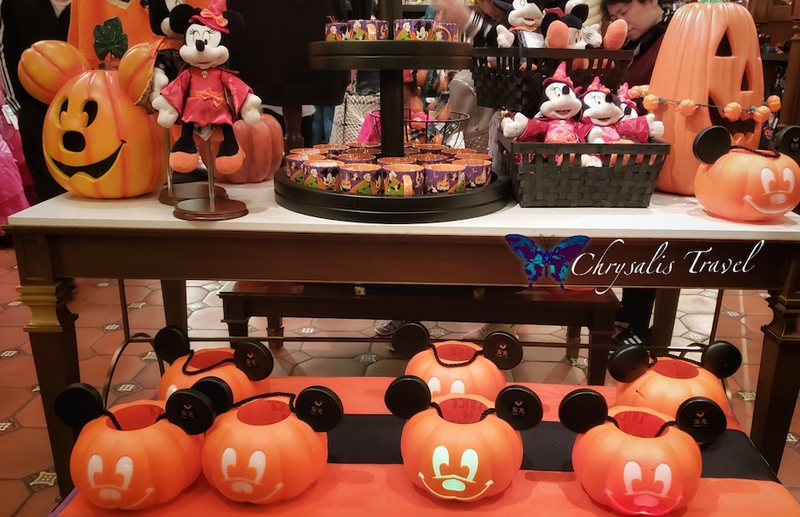 Tokyo Disney Resort doesn’t do trick-or-treating, and the domestic Disney Parks only dispense candy with paid Halloween parties. 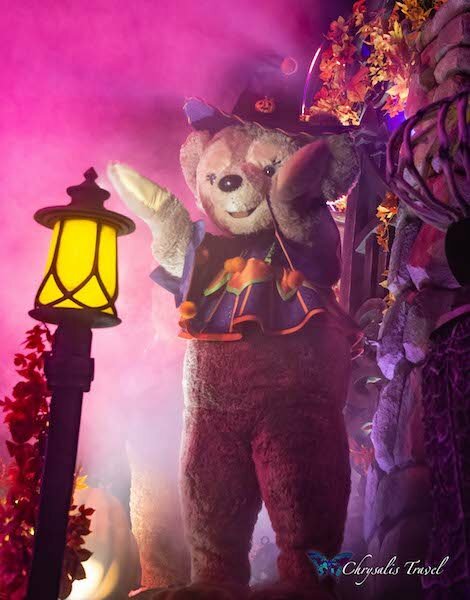 Disneyland Paris has hosted trick-or-treating in the past with their character meet and greets. Shanghai Disneyland had free candy at many of the attractions and stores. We enjoyed heart-shaped strawberry gummies and lollipops in mango, strawberry, and milk flavors. 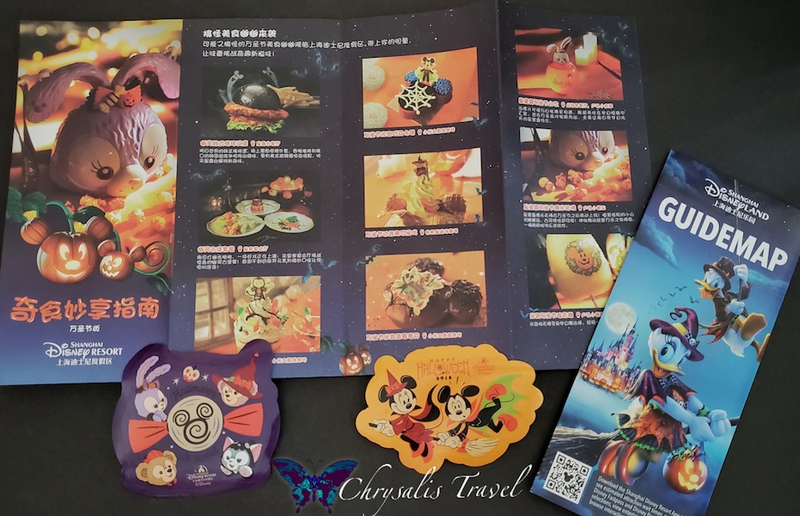 Cast members were also very generous in giving guests special SHDL Halloween stickers as well (see samples in our map photo above). 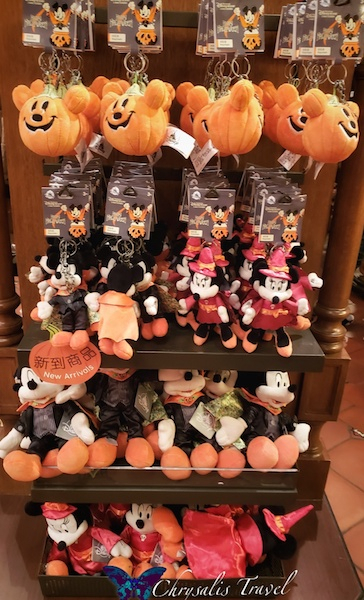 Shanghai Disney Resort’s Halloween merch was themed to vampire Mickey and witch Minnie. We suspected (and confirmed) that these were the same designs used both at Disneyland and Disney World this year. They also had the “Boo!” balloons that we saw at both domestic Disney Parks. 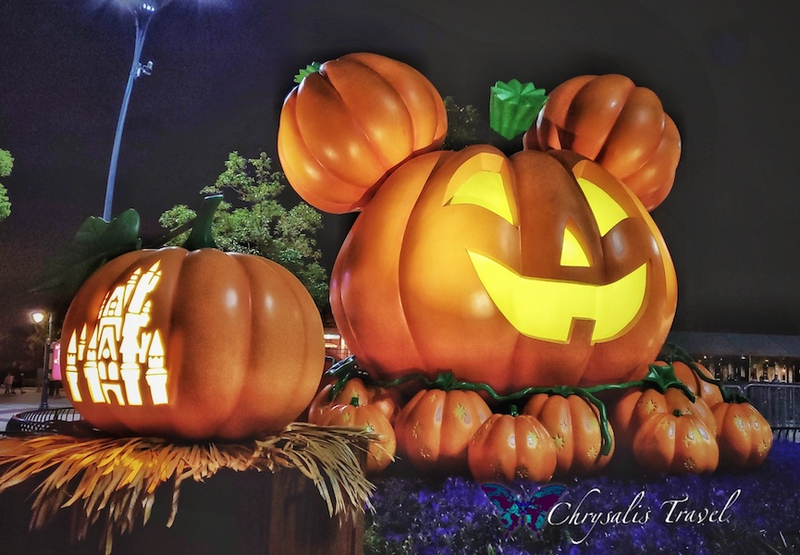 Here are the light-up Mickey pumpkins that cast members were using for trick-or-treating. There were also mugs and t-shirts with the vampire Mickey/witch Minnie design. Perhaps more unique were the keychain-sized dangle plush that are very popular in the Asian Disney Parks. We also saw Jack Skellington face mugs, and the Oogie Boogie beanie hats available stateside. If you’re looking for uniquely SHDL Halloween merch, it would be their Duffy line. 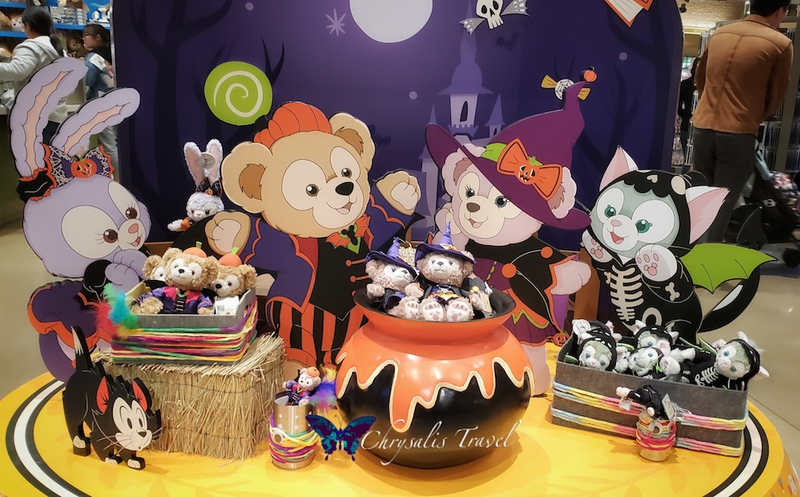 Duffy, ShellieMay, Gelatoni, and StellaLou medium-sized plush are all dressed in their SHDL exclusive Halloween costumes. 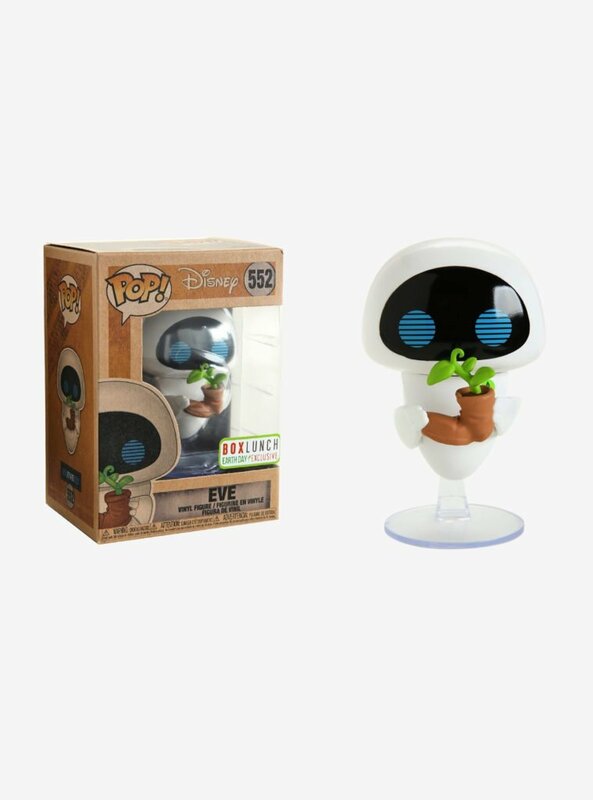 They were available in the Park, and at World of Disney in Disneytown. This giant Mickey Pumpkin stood outside of the World of Disney, and was a great photo op for guests even if they didn’t get inside the Park. Disneytown also hosted an evening Halloween dance party on weekends. 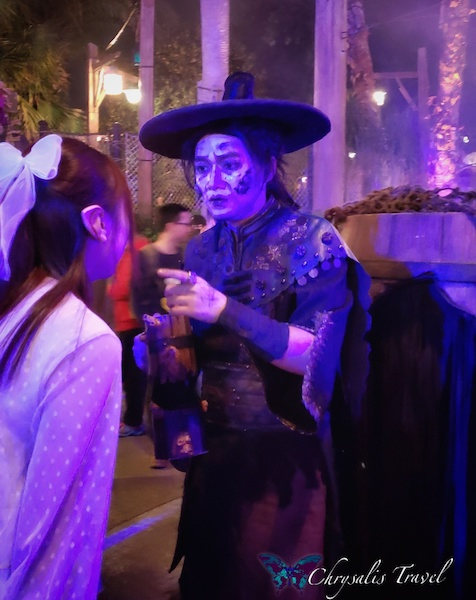 Hope you enjoyed our tour of Halloween after dark at Shanghai Disneyland! Gloria Hasler is a freelance travel writer and photographer. She is a professional travel consultant, owner of Chrysalis Travel, and – together with her husband – co-founder of the Six Castles Club.